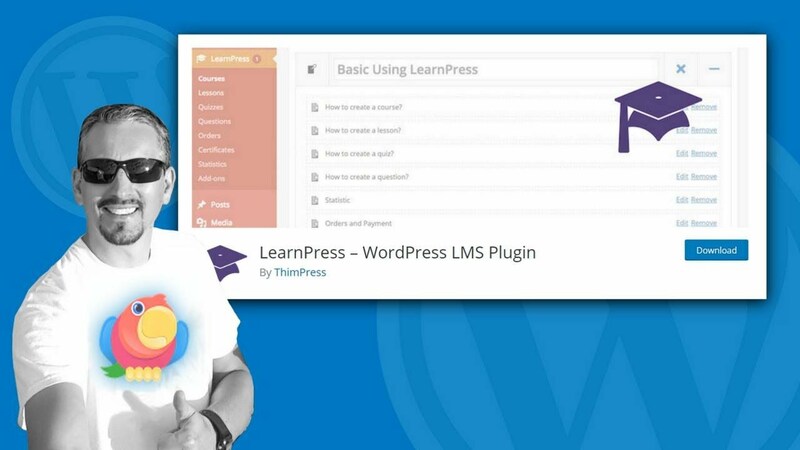 Want to automate key tasks at your WordPress site to save time and simplify your workflows? 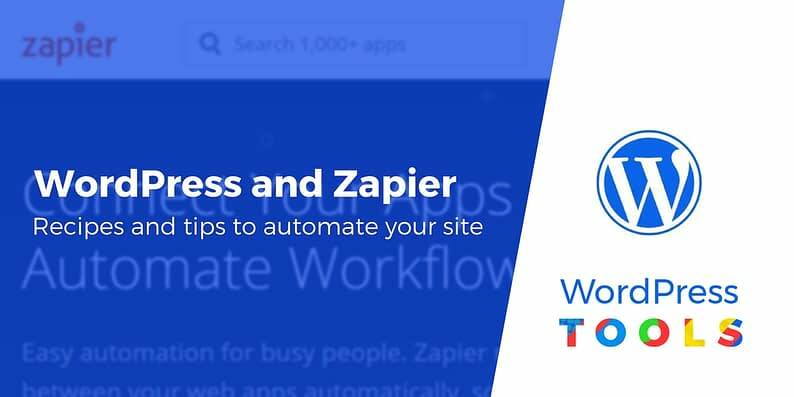 With the WordPress Zapier recipes and tips that I’ll share in this post, you’ll be able to connect your WordPress site to a ton of different websites, tools, and apps, to automate WordPress in some neat ways. I’ll start with a very brief introduction to what Zapier is, in case you’ve never heard of this wonderful tool. Then, I’ll get into some of the most helpful WordPress Zapier recipes you can start using today. What is Zapier? What are WordPress Zapier recipes? 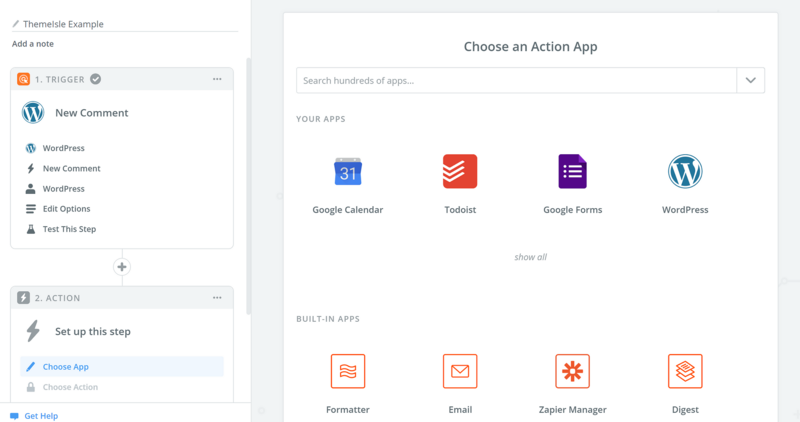 If you’re not familiar with Zapier, it’s a tool that lets you “connect” two different “apps” together. For this example, one of those apps is your WordPress site. As for the other app – that’s what this post is about! Each connection is called a “recipe”. So a WordPress Zapier recipe is just one specific connection between your WordPress site and another tool. Ready for the fun part? Here are some of the best WordPress Zapier recipes (or ideas for recipes) that you can start applying today. When possible, I’ll share a link to the Zapier recipe page so that you can use the premade template, rather than setting up each WordPress Zapier recipe from scratch. And for each recipe, I’ll also share the relevant actions and triggers. If you’re not sure how to use these actions and triggers in WordPress Zapier recipes, I’ll give you a quick tutorial for that at the end of the post. One of the simplest uses for Zapier is to automatically share your new WordPress posts on social media. Each social network is technically a separate recipe, but I’m lumping them all together for simplicity’s sake. Alternatively, you can also automatically add posts to Buffer, from which you can push them out to any of your social channels. Zapier can also help you go in the other direction. For example, maybe you want to automatically share your Instagram content or YouTube videos on your WordPress site as blog posts. Rather than doing this manually, you can use Zapier to automatically create a new WordPress post whenever you share a new image on Instagram or publish a new YouTube video. Another option would be to grab an RSS feed for those sources and import RSS feed items as blog posts. Zapier includes a WordPress trigger that lets you kick off a recipe when there’s a new comment at your site. Similarly, you can also use Zapier’s WooCommerce actions to trigger notifications for new WooCommerce orders. Again, you can receive these notifications via any app/method that Zapier supports. If you allow public registration – like a membership site or an online course – you can use Zapier to automatically add new users to your CRM of choice. 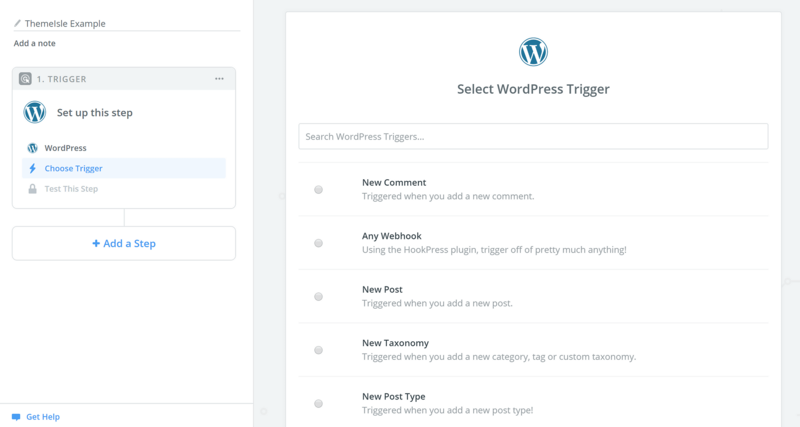 With Zapier’s New User WordPress trigger, you can pass information from new users to any of the CRM tools that Zapier supports. 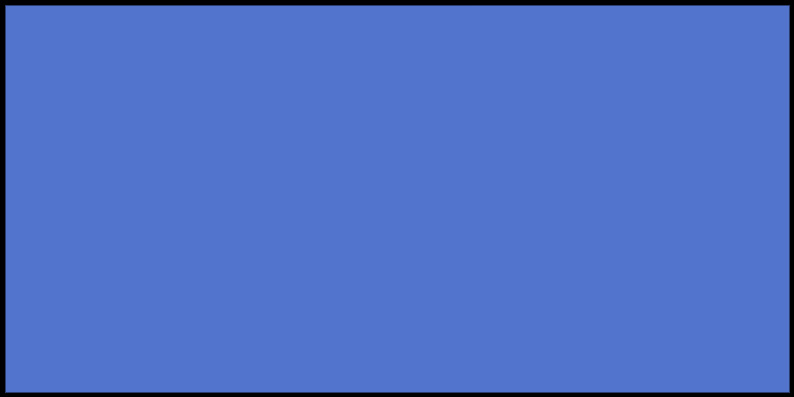 Here at ThemeIsle, we use Trello to organize all of our editorial efforts. If you do the same, there are a number of ways that you can use Zapier to connect your Trello boards with WordPress. *Zapier has other helpful Trello actions, too. For example – “Add Members to Card”, “Update Card”, “Move Card”, etc. Want visitors to your site to be able to submit new WordPress posts or custom post types? Normally, you’d need a pricey premium form plugin for that. But with Zapier, you can set it up for free so that whenever a user submits something via Google Forms (or some other form tools), you can automatically turn that information into a WordPress post (or custom post type). You’ll also be able to choose whether or not to automatically publish the content, or hold it for moderation. While you should certainly have a separate backup process in place for your entire site, Zapier includes some neat features to back up the text of your blog posts or the media that you upload, which might come in handy in the future. If you’re running a WooCommerce store, you might want to get your order data into Google Sheets for further analysis. With Zapier, you can automatically add new orders straight to your chosen spreadsheet. There’s a premade recipe for that here. Or, you can also do something similar with Trello. 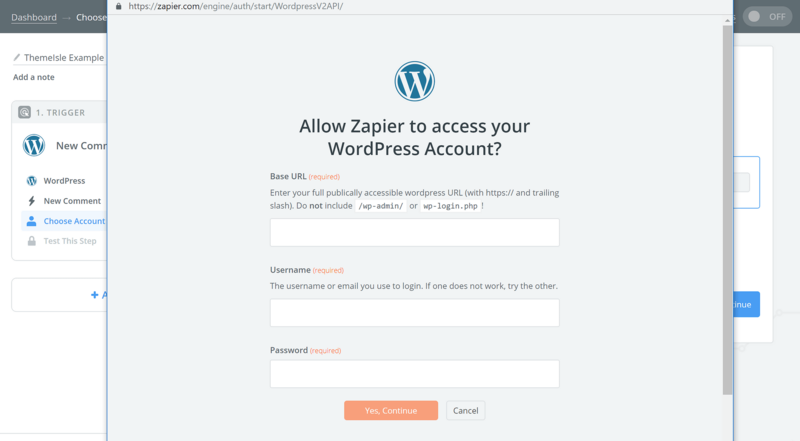 Many WordPress form plugins include dedicated Zapier integrations that let you connect form submissions to any of the apps on Zapier. 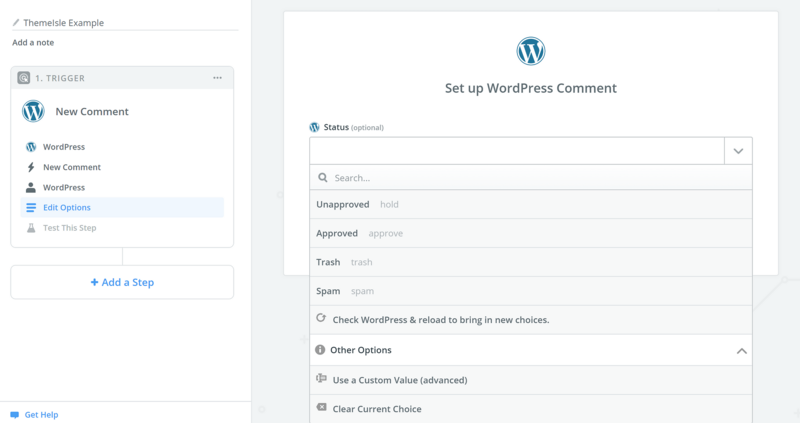 Unfortunately, these integrations are often not free, but they do let you get creative with custom WordPress Zapier recipes based on your WordPress forms. The really great thing about Zapier is that it’s so flexible. That is, the ideas in this post are just scratching the surface. So once you get the hang of things, I encourage you to consider creating your own recipes. You can start recipes based on any of the following conditions. Beyond that, WooCommerce also has its own set of triggers and actions. And if you want even more triggers and actions, the Uncanny Automator plugin adds triggers and actions for tools like bbPress, LearnDash, The Events Calendar, and a lot more. So…browse the full collection of Zapier apps. Then, come up with some unique ways to apply those triggers and actions to your own workflows! If you’re not sure how to implement all those recipes I showed you above, here’s a quick tutorial on how to set things up. Then, you’ll need to connect Zapier to the account for whatever service you’re using as your trigger. And that’s it! Once you finish up your action, your recipe will be ready to start saving you time. Have any other questions about how to use WordPress Zapier recipes to automate your workflows? Ask away in the comments section!